I was joking around with the Hubs that we have come into a DIY Renaissance. We've been opting to do a lot of things ourselves, things that we have paid to have done for us in the past. 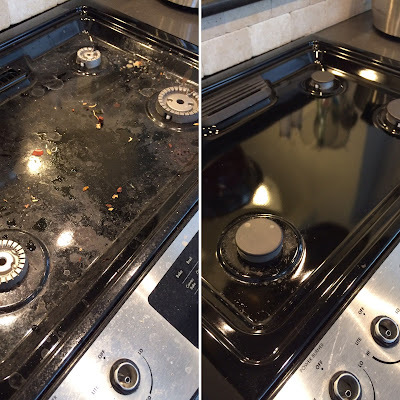 One of them is stove top cleaning. 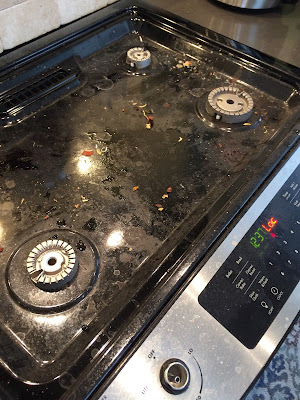 I admit that I am not on top of keeping a clean kitchen on a daily basis and am guilty of letting new grease pile on top of old grease and letting them hang out for ... weeks. Below is the before picture. And below is the after picture. It's the first pass and I'm okay with it. You can see that around the burners the grease is a little harder to clean off. Compared to what it was like before I'm totally okay with this. What you want to do is to make a liquid concoction of half soap and half vinegar. 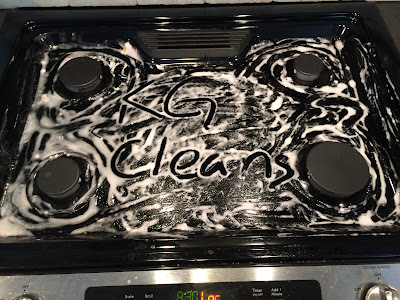 Sprinkle, spray, or pour it onto your stove where you want to clean. 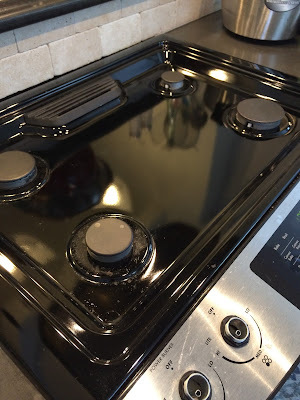 Not too much because you don't want to flood your stove, but just enough that the surface is wet and will stay wet for a couple of hours. After spreading the liquid around, sprinkle some baking soda over it and let it fizz. You want a runny paste like the picture shows below. Let that sit for a couple of hours then start rubbing the greasy areas with a rag or your fingers. 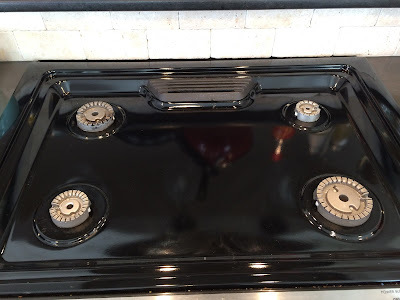 Wipe everything off and you will have a clean stove. For harder to remove grease spots, I sprinkled a little bit of table salt and "exfoliated" the area. Some of the grease spots came off and some stayed. However, I'm comfortable with the results because this is still a huge improvement from before. My favorite part about this new cleaning method is that I have all the ingredients I need at home and it doesn't emit any harsh fumes. That's it! Happy cleaning, everybody! My husband is our family's designated dessert maker / baker. 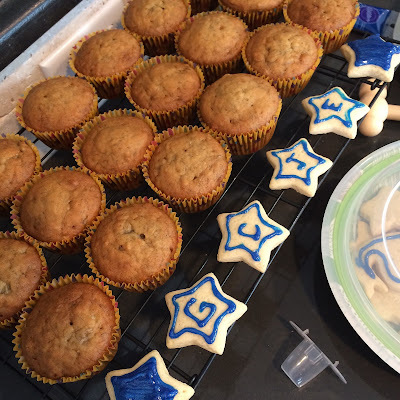 He is such a wonderful daddy, always thinking about nice treats our daughters will like (and he probably knows that I bake in my imagination, not in real life). My husband and I are no scientists but we are absolutely fascinated by space and deep space. 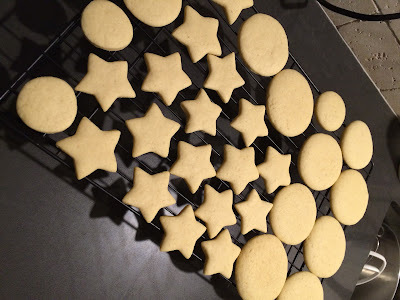 So, in honor of that, here are his Stars, Moons, Planets and Suns Sugar Cookies. These were two different batches of cookies. I woke up one day and found the star sugar cookies decorated like this. It seemed like a travesty to eat them without taking a picture of them and commemorating them to Instagram for all time. He had cookies for each person. Awwww! Cream butter and sugar together, then add egg and vanilla. Beat/cream them until everything is incorporated, then mix in the dry ingredients and mix with a wooden spoon before turning it out to knead until the dough comes together. Wrap and set the dough in the fridge for a few minutes, no more than 20 minutes, then roll out the dough and cut out the shapes. Bake in 350 degree oven for between 10-12 minutes, until the edge barely turns brown. When they're ready, take them out of the oven, let them cool on the cookie sheet for a minute before moving them to a rack. Fresh out of the oven these cookies are so soft and fluffy, they're so good! They travel well because they're so easy to stack. These are always a great "snack" to take when we go to our local botanical garden. Another itty bitty empties post. I think it gave nice light to medium coverage. But as I've gotten older my skin has changed in texture, elasticity, and color and the cream started to look pretty gray against my skin. Also 6 years old! Age has not been its friend. It has become clingy and difficult to use against my looser and droopier hooded monolids. I tossed it out. The black, olive and gold eyeliners are still ok though. It was ok. 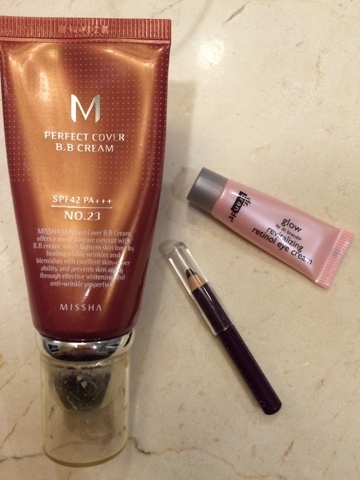 The Retinol made my skin flakey around my eyes, which I didn't like too much. I didn't see much happening there so I don't really have an opinion on it. I took a class on making herbal soaps today and I am so pumped up about it. My daughter Gummybear has sensitive skin and I've been wanting to make her homemade organic skincare stuff. So I think this is a step in the right direction. These are the soaps I made. 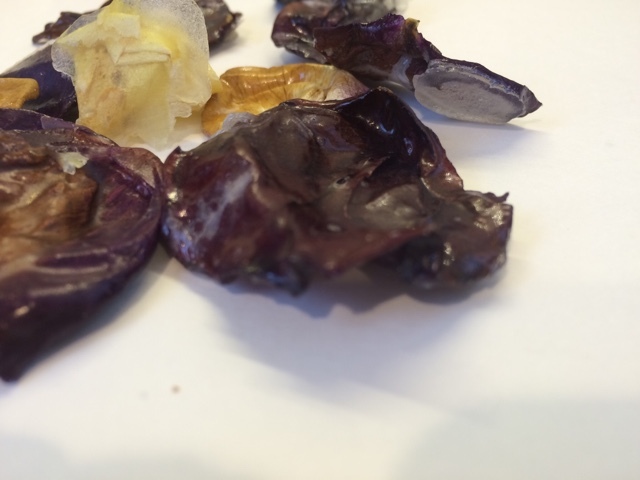 In the lavender soaps above I added almond oil, Shea butter, vegetable glycerin, organic coarse sea salt, lavender essential oil, and julienned rose petals. I was really surprised by how the salt looks like snow against the soap. It looks so decorative but it smells so divine! I used it this evening on my daughters and myself and am really impressed with how this soap stood up to water. It didn't get soggy and our skin didn't get that tight feeling after our showers. The above soaps are what my instructor said were "black soaps." He explained that they derive their name from the herbs makers mixed into them. He said that with black soaps makers put all kinds of herbs so they could offer a lot of benefits to people, rather than confine the soap to one or two herbs. 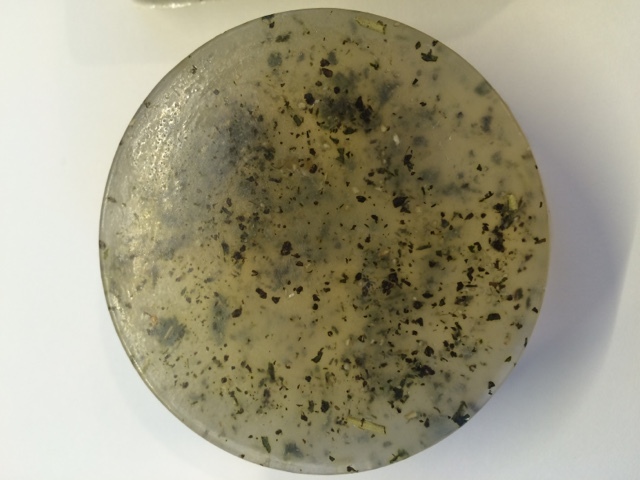 The herbs darken the soaps, hence the name. In mine I put crushed mint, Rosemary, oatmeal flour, Rosemary and spearmint essential oils, Shea butter, almond oil, and vegetable glycerin. I wanted this soap to be refreshing and open up the nasal passages. We'll see how it goes! 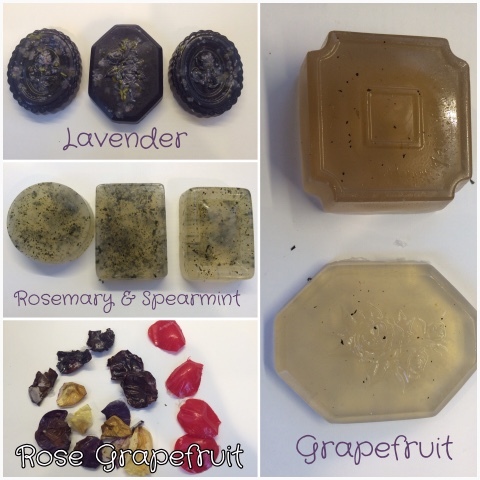 The above are soaps infused with apricot kernel oil, vegetable glycerin, shea butter, and grapefruit essential oil. 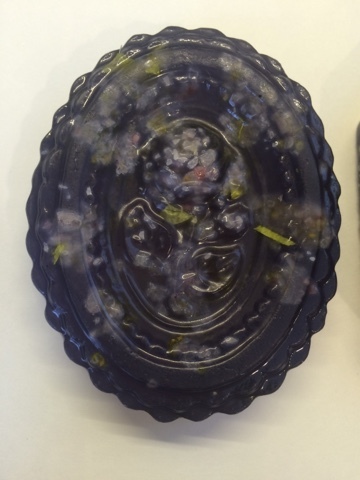 These were actually the left over soap I didn't get to use as the class was winding down. 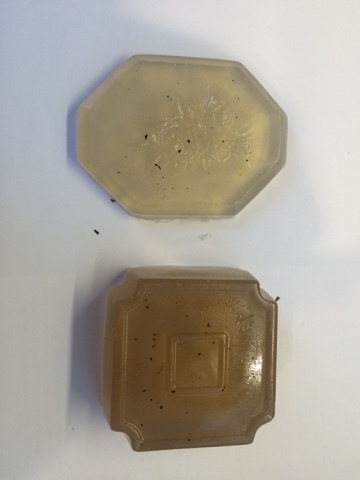 The point of making this soap was to make rose petal soap. These rose petal soaps are supposed to be single use soaps. 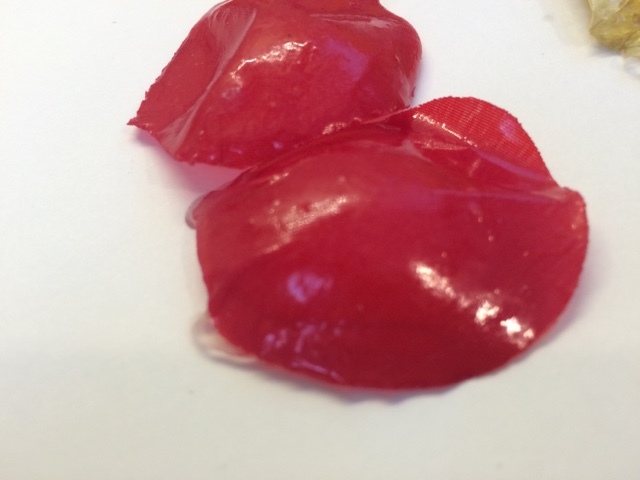 Basically, if you don't like the soaps at public restrooms, you can take your own rose petals (dried or artificial) dipped in soap, and use them to wash your hands. You can toss the rose petal afterwards. 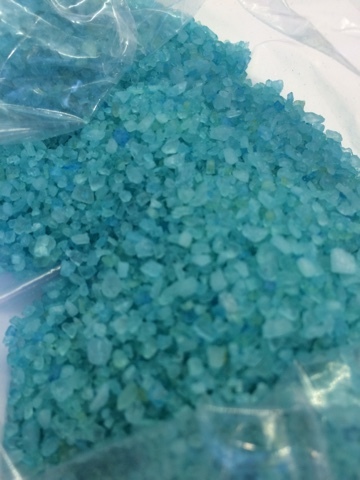 We also made bath salts! This is my Rosemary bath salt. 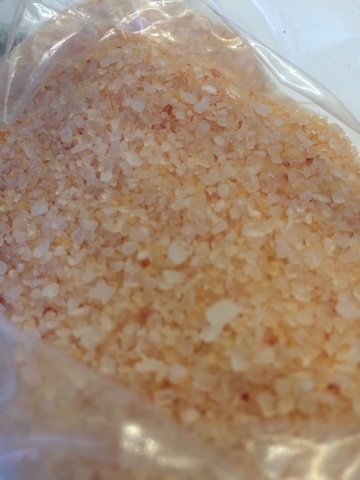 And this is my lavender bath salt. Too bad that the girls JUST graduated from baths to showers earlier this week.